Bulk carrier Tasman Sea is expected to complete the offloading of 11, 880 metric tonnes of cement clinkers at the Suva Port today. 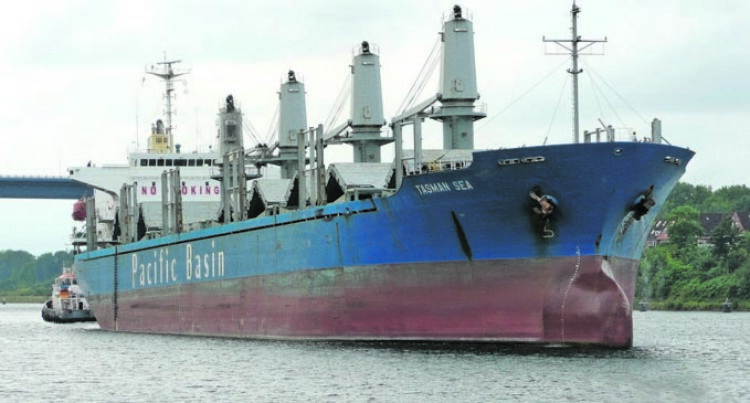 According to vessel agent Transam Fiji Limited Operations Manager Madulesh Lakhan, the vessel had finished offloading clinker for the Tengy Cement Factory in Lautoka last week and it will complete its clinker offloading in Suva today. “The vessel offloaded 15,000 metric tonnes of clinker at the Lautoka port last week,” Mr Lakhan said. “The vessel had onboard 26,880 metric tonnes of clinker for the two ports,” he said. “The clinkers are offloaded by grabber onto hopper and from then to trucks, we then provide transportation to Pacific Cement Limited and Tengy Cement Factory. “It has only been a year since we started shipping clinkers to Fiji from Japan. Mr Lakhan also said that importation of clinker is arranged by TCF every three months. Clinker is an important component in the making of cement. It is a dark grey nodular material made by heating ground limestone and clay at a temperature of about 1400 °C – 1500 °C. The nodules are ground up to a fine powder to produce cement, with a small amount of gypsum added to control the setting properties. Work at the mentioned cement factories is determined with the availability of clinker.